When a plumbing problem rears it’s ugly head it’s important that you take the problem seriously and deal with it that way too. Our plumbing team can respond to an emergency call within 60 minutes and each of our team also carries with them a supply of the most standard plumbing parts needed for the vast majority of jobs. 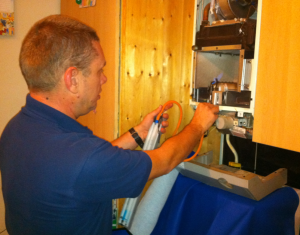 This allows our plumbers to complete work on well over 95% of our calls with a single visit. Your home or business can always benefit from having blockages in your central system washed away with a professional powerflush. Water leaks are annoying and can be expensive but gas leaks can be potentially fatal so you never want to ignore leaks of any kind. Our leak detection service can locate the source of any leak anywhere on your property using a range of very sophisticated equipment such as thermal imaging cameras, acoustic leak detectors and snake cameras for example. And the best part of our leak detection service is that it’s all non-destructive which means we never have to dig or drill any holes to find your leak. If you’d like to learn more about how ADI Plumbers can help you with whatever type of plumbing issue you’re dealing with right now why not call us FREE now on 0800 731 3843?